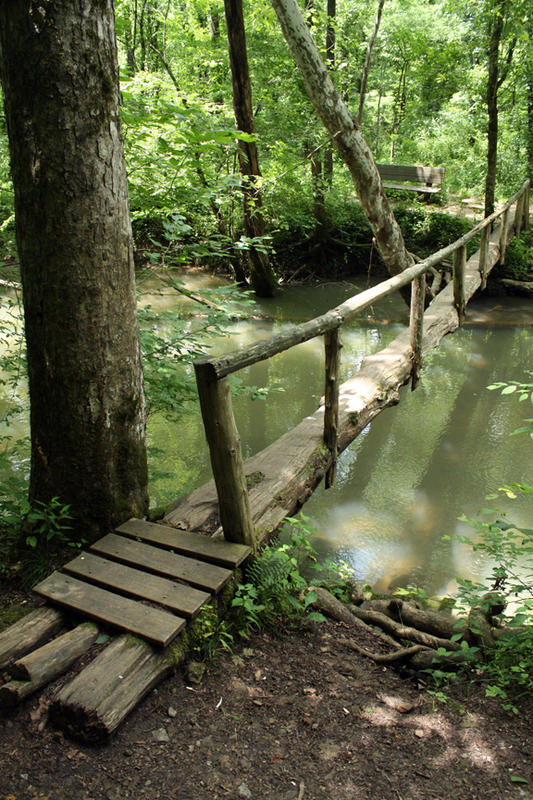 One of the largest and mostly untouched sections of Southeastern wilderness can be found along the Alabama-Tennessee state line in Jackson County. This 21,453- acre area is known as the Walls of Jericho, but it is split into defined sections within each state. In Tennessee, the Walls of Jericho site is designated as a state natural area made up of the 8,943-acre Bear Hollow Mountain Wildlife Management Area (WMA). In Alabama, the 12,510-acre section known as the of the Walls of Jericho tract is part of the 60,732-acre James D. Martin-Skyline WMA, and is jointly managed by the Alabama State Lands Division and the Wildlife and Freshwater Fisheries Division (WFF) with State Lands focused on the Forever Wild Land Trust aspects of the property and WFF on hunting and fishing. Well-known for its significant biological diversity, Walls of Jericho is home to many unique habitats, plants and animals. The primary factor making this area such a biological hotspot is its location. The Walls of Jericho is situated where the longest hardwood forested plateau on Earth, the Cumberland, thrusts into Alabama. Additionally, its proximity to the Paint Rock River Basin, one of the last free flowing rivers in the Southeastern U.S., helps create a fertile environment that supports a dynamic ecosystem. The Walls of Jericho is a natural menagerie with a vast catalog of flora and fauna that includes hooded warbler, Kentucky warbler, blue-winged warbler, chestnut-sided warbler, ruffed grouse, green salamander, four-toed salamander, mountain chorus frog, Eastern milk snake, grey bats, Indiana bat, Rafiesque’s big-eared bat, Tennessee cave salamander, Alleghany woodrat, white nodding trillium, Cumberland rosinweed, limerock arrowood, bloodroot, yellow lady’s slipper, Dutchman’s breeches and much, much more. The Paint Rock River Basin is also home to many endangered and imperiled aquatic species. For decades, public access to Walls of Jericho was limited due to private ownership and business interests. That changed in 2003 when The Nature Conservancy purchased the Walls of Jericho tract from the Stevenson Land Company. 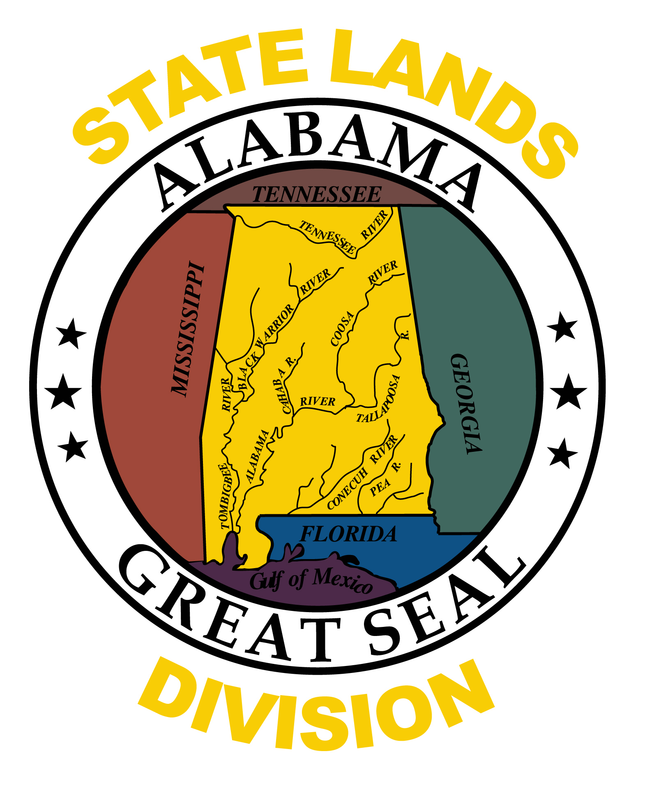 The Forever Wild Land Trust purchased the Alabama acreage in 2004 and began developing hiking and horseback trails. 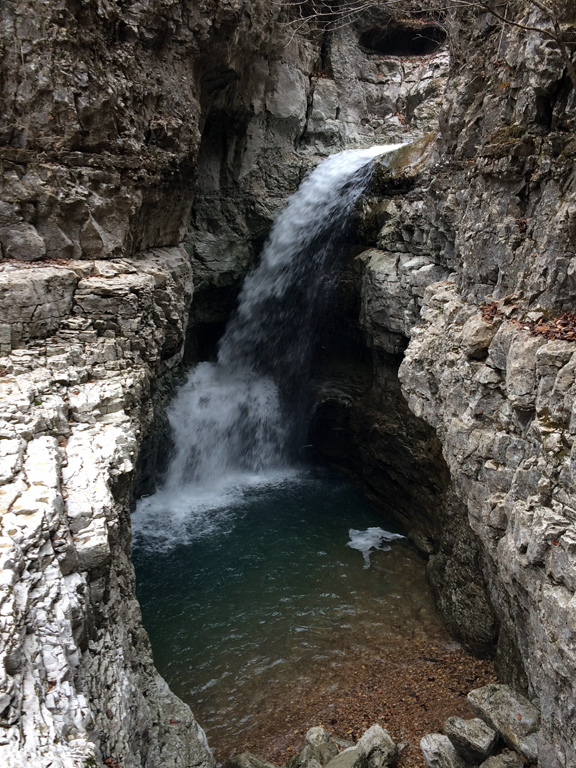 Currently, the Walls of Jericho offers camping, hiking, horseback riding, hunting (including a nearby disabled hunting area), stream fishing, birding, and wildlife and wildflower viewing opportunities. The main attraction on this Forever Wild tract is the Walls of Jericho hiking trail. The 6-mile round-trip hike is strenuous, but well-worth the effort. From the trailhead, the trek descends more than 1,000 feet into a box canyon that showcases the dynamic landscapes of the Cumberland. From the exposed limestone formations decorated with lichen and moss to the tranquility of Hurricane Creek, the trail offers new perspectives with each switchback. As the trail winds into the canyon, the sound of the forest is as diverse as the scenery. Pileated woodpeckers cluck among the limestone outcroppings near the trailhead, chipmunks rustle through leaf litter near small cave openings on the descent toward the ripple of Hurricane Creek, and muddy footsteps echo between bluff near the end of the trail. Clark Cemetery and a primitive campsite serve as the gateway to the actual limestone bluff known as the Walls of Jericho. The bluff funnels hikers into a large limestone amphitheater carved over millennia by Turkey Creek which flows through its center. Depending on your pace and fitness level, reaching the limestone amphitheater takes a few hours. The trailhead kiosk suggests a six hour trek, but many hikers say four hours is sufficient. 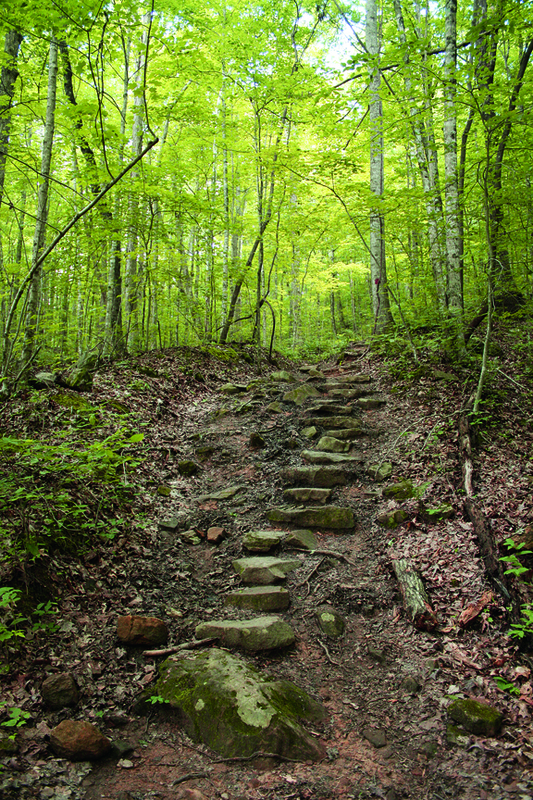 A less strenuous, but equally beautiful alternative to the Walls of Jericho trail is the 4.7-mile Bear Den Loop. This moderate hike begins at the hiking trailhead parking lot and meanders east of Highway 79 before returning to the trail- head. An 8.3-mile horseback riding loop is also available. The horseback trail parallels Highway 79 before descending into the canyon. It crosses the Walls of Jericho trail at a few points. The hiking trails are blazed in red and the horse trail in yellow. A hitching post is located near the Clark Cemetery campsite for riders who wish to explore the Walls on foot (no horses are permitted beyond this point). The trails at Walls of Jericho are as beautiful as any trek through the Smoky Mountains, but be prepared for a strenuous day of hiking. If you plan to bring kids, make sure they’re old enough to stay on the trail as there is plenty of poison ivy and venomous snakes are not uncommon. In addition to onsite primitive camping, Walls of Jericho is close to Guntersville, Monte Sano, DeSoto and Buck’s Pocket state parks, which offer cabins, camping, or hotel rooms. Prior to your visit check the weather forecast, pack plenty of water, and give yourself ample time to explore the trails. You’ll be glad you did. Walls of Jericho is located in Jackson County, Ala., just north of the Skyline/Hytop community on Highway 79. Second parking lot is for hiking.